Is there, or isn't there an ageing impact on our economies? Well one way of addressing this issue is to look at the recent economic performance of some of those who are most directly affected. 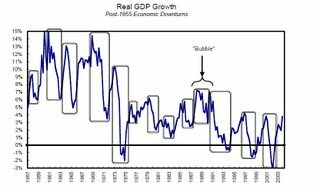 Now one of the key postulates of neo-classical growth theory is that each economy has its own long run steady state growth rate. This is in many ways a highly questionable assumption and is one which, with the notable exception of the US, is very hard to sustain empirically over the longer term. Economic performance tends to fluctuate, the big question is: does it fluctuate following any kind of identifiable pattern? Well, lets take a look at the Japanese case. Here's a convenient graph of Japanese economic growth 1955 to 2003 prepared by US economist Michael Smitka from Japanese data available here. What is obvious from looking at this profile is that Japanese growth has been far from uniform over the last 50 years or so. This really shouldn't be so surprising when we think about economic theory a little. Key components of economic growth are the proportions of the total population working, and the kinds of activities they are engaged in. Now if we look at the early part of the graph we can see very high growth rates (which we can also find in eg China now). These are due in part to an ever greater part of the total population becoming involved in economically productive activity, and to a technological 'catching up' process. As developing countries tend to start at some distance from the existing technological frontier then growth can be proportionately more rapid as they close the distance (again this can be seen now in the Eastern European EU accession economies). With time this growth spurt eventually slows, but the loss is to some extent offset as a society moves up the median age brackets by a growing importance of what have come to be known as 'prime age workers'. 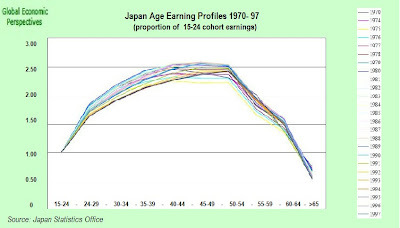 The prime age wage/productivity effect can be seen in the chart below which shows how the age related earnings structure has altered in Japan over the years between 1970 and 1997. The most important point to note is that wages generally peak somewhere in the 50-54 range (even though many workers in Japan currently continue to work to 75) and this wage profile may be assumed to be some sort of proxy for what actually happens to productivity. One very revealing detail is that while the shape of the hump has changed somewhat over the years there has been little noticeable drift to the right, which should give some indication of the age-related productivity problem. Going back to the upper chart, post-bubble Japan has grown significantly more slowly, although thanks to the strong export position (and China related demand) the economy has still managed an average of 2.5% a year since the end of 2001. 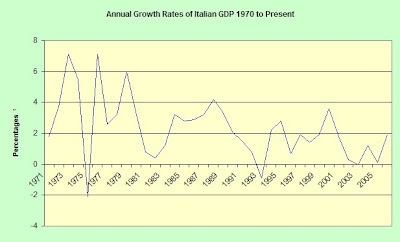 Indeed since 1990 Italian GDP growth has only managed an average of something like 1.4% growth per annum, as can be seen is the next chart. 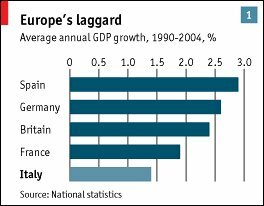 As the Economist (from whom the accompanying chart is drawn) points out Italy's average economic growth over the past 15 years has been the slowest in the European Union, and all the years of low growth take a toll, since it's economy is now only about 80% the size of the UK one. Recent years have been worse rather than better, and the German economy shrank (0.2%) in 2003, and grew by 1.1% in both 2004 and 2005. So there we have it. Japan, Germany and Italy are the three oldest societies on the planet (median ages 42.64,42.16 and 41.77 respectively), and the economic growth record seems to bear out the suggestion that ageing does have a noteable impact on economic performance. "Key components of economic growth are the proportions of the total population working, and the kinds of activities they are engaged in." This epitomizes that economics and demograhics go hand in hand and crucially that the potential output on an economy is fixed with the population as an anchor. So simple, yet so important. More elaborated comments will follow later :). Apart from the obvious point (stated in my comment above) I think we can draw out another important point which for example relates to all the current flurry on Japan's recovery. The main reason why I think Japan's recovery is anything but sustainble is because I simply do not see the domestic "climate" to support a recovery. This do not mean that Japan is going to go bankrupt but it means that the potential output of the economy will most likely decline which means that the recovery of Japan most likely won't bring them back amongst the growth tigers of the world. I know that I am perhaps just re-capping Edward's arguments but to state my main point (also Edward's I suspect?) this is important in an economics theory/research perspective because demographics become an important underlying variable for macro-economists to consider. Is this news ? Perhaps not and demographics might not be the only determinant factor but surely an important one especially to balance and differentiate all those claims of recovery in Germany and Japan. It would be good to know if there were any countries (among the OECD for instance) for which the "Age Earning Profile" showed a different pattern and how that correlated to growth. The pattern you have highlighted may simply be due to structural ageism : everybody wants to employ young fresh blood to whom they can pay low wages and mould the way they like. That doesn't make them more "productive" or older employees less so. Does experience of life and work count for nothing ? In that case all our CEOs should be under 30, right ? i realise i need to clarify my earlier post further. it may be misleading as it stands. i stand by my point re structural ageism but the pattern may be due to labour supply and demand - you are willing to pay more for a younger person or alternatively let go an older person because you can work the younger person harder but not necessarily smarter which is what you need for real productivity in a knowledge economy. "The pattern you have highlighted may simply be due to structural ageism : everybody wants to employ young fresh blood to whom they can pay low wages and mould the way they like." Well it isn't as simple as that. Young people are in fact not very productive, that is why the curve is lower in the younger ages ranges and rises to a peak around 50 to 55. There are two factors which tend to work in opposing dircetions: speed (including cognitive processing speed) and experience. Young people score high on the former, older people higher on the latter. Thus 'productivity' may vary widely across occupations (and these curves only reveal aggregates). Young mathematicians or athletes on the one hand, and judges or Chairmen of the Federal Reserve on the other. But I am also saying more. For 'ageing' to be manageable these curves need to shift to the right, we need to enlarge our productive years to balance the increase in life expectancy, if we don't we can't expect to sustain our pensions systems. This is known as proportional life rescaling and I will be writing much more on this topic. "It would be good to know if there were any countries (among the OECD for instance) for which the "Age Earning Profile" showed a different pattern"
I'm afraid not. These curves are the nearest thing we have to a 'universal', they go across countries and across time, though the shape of the curve and the ages ranges vary. The Tsimane project (see sidebar) have even identified these in a hunter gatherer context among native Indians in Peru and Bolivia. Berkeley demographer Ronald Lee has also made great use of all this. Again more, nuch more, on all this in the not too distant future. "because you can work the younger person harder but not necessarily smarter"
Yes, this is really the trade off. I would like to add some results of quantitative analysis to your post. Actually, real economic growth is driven by the change in the inflow of young people (from 9 years of age in the USA to 18 - in Japan and Euroipean countries) not the ageing. The fluctuations of this specific- (young)-age population just add to some potential growth, which rate is inversely proportional to the attained level of real GDP per capita. 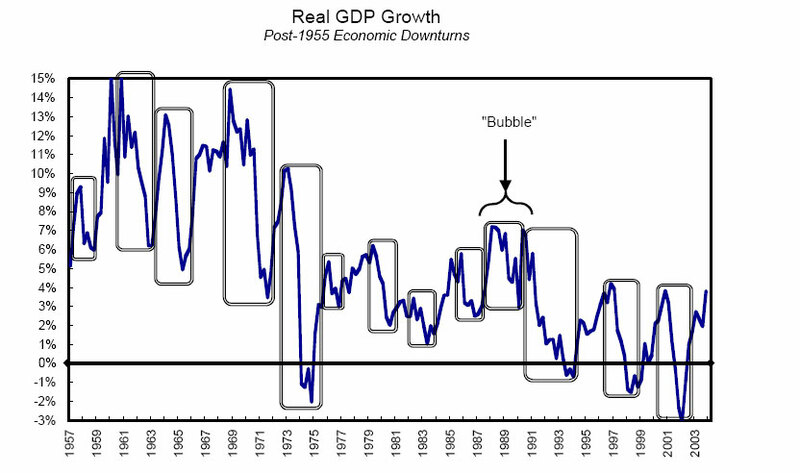 Only growing over time inflow of the youngsters (as in the USA since 1960) can slightly increase the potential growth. In European countries, usually the inflow has been constant (or decreasing) over the last 50 years and they have been developing at the potential rate. Interesting, Ireland is a country with a very strange population pyramide, which is very similar to that in Japan 30 years ago. I would bet that dark ( underpotential performance and deflation) years are coming. I've just left a comment on one of your posts. Nothing special, but I do think you are barking up the RIGHT tree. The way you talk sometimes seems a little determinist, but, OTOH, I am convinced, as evidently you are, that all of this may be much more simple than many people imagine. 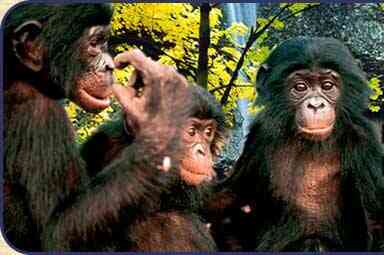 You are coming up with correlates, I think Claus and I can offer reasons for why these correlates might be there. Maybe we should talk. Also, try this one from Robert Martin, my guess is that you will like it. very interesting ideas throughout this blog. Ivan's analysis ( I just read the abstract not the whole paper) is very interesting. I have a reservation in that (as it happens very much in medicine/biology) you can find corelations between different things but that in itself does not prove a causal relationship. on topic: it will be very interesting to see how Japan, Germany and Italy will navigate the near future. The question is if the slow economic growth that these countries are facing due to demographic constraints is going to affect them as much as we may think. They are wealthy countries ( GDP is important but wealth is probably even more important), they are also well educated ones and they are also quite scientifically and technologically savvy places. even though their global economic clout may diminish they still can hope in increase in the GDP per capita. as we enter the "knowledge based economy" demography may play a different role than in the industrial society. of course reforms will be needed ( social security systems created for industrial world may not work in the new situation). even though I have a dose of scepticism about the degree of anthropologic impact on climatic change ( not quite sure that rising CO2 concentration in atmosphere will necesarily have such a big impact as a lot of people are now concerned will have) I do agree that we should be careful about it. from this perspective plateauing of the world population would be absolutely a positive development. I am also not sure if the slow population decline in developed countries (and estimated in the developing countries) is such a bad thing for them and for the world. this in and by itself does not preclude that the mankind will not be able to achieve a golden age when most of its people will live long, healthy and prosperous lives on a beautiful planet. Sorry I have been so long getting back, but I have been really busy the last ten days or so, and since you make points I need to think about I have found it hard to grap a sufficiently large space of time. "you can find corelations between different things but that in itself does not prove a causal relationship." I totally agree, you need correlations and a theoretical explanation, and then you need predictions, and testing and more correlations and so on. Still getting some sort of correlation or another is always a good start. If you begin to dig and then the data don't fit at all you are obviously completely wasting your time, but this doesn't seem to be the case here. I am currently working on a new version of this post (that you can find here) and I am coming up with even more correlates. Basically you also need to take into account existing theory, since we never work in a vacuum. Basically there may well be no absolutes here, and maybe we are simply looking for the theoretical explanation which does the best job of work, and this is why I put Neo-classical theory on the test-bed, not because I have an axe to grind, but because it is the best we have, and yet in this case our best just doesn't seem to be good enough. "The question is if the slow economic growth that these countries are facing due to demographic constraints is going to affect them as much as we may think." Exactly, and this is a question of being out there, and examining, and scrutinising every day. Since we haven't been here before, we simply don't know. But if you look carefully enough you can find cracks appearing in the structural walls that don't look at all promising. The main question I think is how to carry the burden of an ever increasing elderly dependent population. To find the resources to achieve this you need economic growth, and to get economic growth in ageing societies it needs to be exports driven, since internal demand is not strong, and this appears to generate a certain fragility about the whole situation. Certainly I don't think it is a mere coincidence that two of the oldest three - Japan and Italy - also have the highest Debt to GDP ratios of any country. This raises serious sustainability issues should their economies actually start to shrink at some point as population declines. "They are wealthy countries ( GDP is important but wealth is probably even more important), they are also well educated ones and they are also quite scientifically and technologically savvy places. even though their global economic clout may diminish they still can hope in increase in the GDP per capita." Certainly they can hope to get an increase in GDP per capita, but if you look at the charts I present in the new version of this post, the rate of increase is slowing notably when compared with their younger counterparts. At this point we simply don't know how far this can go. On the wealthy issue, I think you need to bear in mind that wealth is always relative, and in this case relative currency values are important. As I try to argue in this post (and again in this one) large chages in currency values are taking place which over time will significantly change the global ranking in this sense. Also, it isn't clear how much some of these countries are raising the human capital level of their young generations in comparison with the natural wear and tear that occurs as large cohorts age. Basically people who were quite well educated 30 to 40 years ago may not have the appropriate skill-knowledge set to have a lot of value in today's knowledge economy, as I try to point out in this very long piece on the German labour market.The evidence seems to suggest that the countries in question are having success in boosing employment participation rates among older workers, but that the economic value of this is very low indeed. I wouldn't say exactly like child labour in India or Brazil, but if you let yourself think about the possible symmetries in this situation, then you wouldn't be too far from the right ballpark. The similarity comes from having in both cases very large cohorts in precisely the wrong age groups. "from this perspective plateauing of the world population would be absolutely a positive development." I think this is right. Stabilising global population is an important objective. The tricky part are the transitional dynamics. "I am also not sure if the slow population decline in developed countries (and estimated in the developing countries) is such a bad thing for them and for the world." No, I am sure it isn't. We need to distinguish between the excessively high population growth rates in the very high fertility societies, and the excessively low (and even negative rates) in the lowest low fertility societies. BOTH situations are undesireable. There ought to be a level which is "just right", and we ought to be trying to target that. This means applying some of the things we have learnt in the already developed societies to the now developing ones, and in particular getting across to them the importance of not letting fertility drop as low as it has done in some parts of Europe and Asia. At present this is simply not being done. Woops well that came out wrong, thanks for the great comments guys really interesting read! Some wonderful comments, thanks a lot for the insights! You make some very salient points Edward, great read.